Of all the herbs available in the kitchen garden, aloe is perhaps the richest in healing properties and has been rightly named the “first-aid” plant. It has moisturizing and emollient properties and is used in cosmetic creams, sun-lotions, shaving creams and face packs. It can easily be cultivated as a house-plant in a sunny warm spot with good drainage. Cosmetologists mix aloe with several other herbs and draft fancy names for it. Then these “herbal” avatars are sold at exorbitant prices. Growing a plant and using fresh gel is much more effective than bottled gel, simply because it is alive and therefore is more potent. It is the only plant whose extract is applied directly from plant to face in its natural and purest form. Fresh aloe gel should be rubbed on after shaving. Razor burns diminish and cuts heal quickly without scarring. Spread aloe gel on your face. Within minutes, it works by clearing blemishes and giving you a fresh, soft baby look, which other chemicals and concoctions fail to do. Drinking 10 ml aloe juice daily also helps cleanse your skin. Take 1 tsp each of aloe vera gel, mint powder and tulsi (basil) leaves, make a paste and then apply. Wash off first with milk and then water; this also helps clear blemishes. Take 1 tsp each of aloe vera gel, honey and china clay, mix and apply. Take 1 tsp of aloe vera gel, 2 drops of witch hazel and 1 tsp of multani mitti / fuller’s earth. Apply well to remove excess oil as well as to close open pores. Aloe is known to combat wrinkles and defies ageing. Cosmetologists have hailed it as the “water of youth”. Aloe Vera gel penetrates quickly & deeply and it is retained by the skin 3 to 4 times faster than water. Its enzymes remove dead cells, grow new ones, provide moisture and nutrition, get rid of dryness and restore the skin’s elasticity. Aloe, the wonder herb clears acne by removing the dead cells, thereby opening the skin pores and discarding the blocked oil. The scars left by acne also should be treated similarly using aloe. Aloe provides an effective sunscreen against both types of ultraviolet rays (UV-A which causes premature ageing & UV-B which causes sunburn and skin darkening) of the sun. The pulp of aloe juice along with turmeric removes sunburn & reduces oiliness. Sometimes there is a strong burning sensation and redness in the eyes due to factors like long hours in the hot sun, too much eye-strain due to computer usage etc. Here the pulp of the aloe juice placed on each eye can help cool the eyes and rid them of this sensation. Mix fresh aloe gel mixed with curds (for very oily hair you can add multani mitti / fuller’s earth also) and apply it to the hair ½ an hour before bath. It will make your hair bouncy & lustrous. Menstrual irregularities are frequent among woman. Mix pure aloe juice with some jaggery and have it continuously twice a day from a week prior to the expected date / due date of menses. If you can't procure pure juice you can prepare a syrup by boiling large quantity of aloe juice &amp with sugar and make a syrup. More details in the post Home Remedies for delayed periods. Intake of aloe juice / syrup before the in the luteal phase or second half of your menstrual cycle is a good remedy for resolving the problem of late periods. Papaya is also useful in delayed periods. Also read Aloe vera for women's health issues. Some women have painful menses. The same syrup as mentioned above should be used during menses. It improves pelvic circulation and removes spasm. This will help to ease pain caused during menses. The use of aloe is indicated in many geriatric problems such as neuromuscular weakness and osteoarthritis. Intake of 10 gm of aloe with half a gram of turmeric powder acts as an effective blood purifier. Aloe gel hardens into a natural bandage due to its antiseptic, antibacterial and antifungal properties and is widely used for the external treatment or minor wound and inflammatory skin disorders, cuts, bruises and abrasions. Aloe has been traditionally used as a natural remedy for burns-like first degree and second degree thermal burns, and to this effect, the plant is also called “burn plant”. Mixing a dish of aloe by roasting it in a small quantity of ghee / clarified butter (buy ghee from here) and taking it once or twice a week with a meal is a common practice in rural India. This recipe is helpful in cases of chronic gas trouble and distension of abdomen. There is good news for weight watchers. Aloin, the active principle of aloe, has been in anti-obesity preparations too. So what are you waiting for? Go get an aloe vera plant! It is a great post. I liked it. I use the aloe vera plant on my face to get rid of my acne. I have tried everything: proactive, murad, clearasil, you name it! UNLIKE all of those products, for me - this works! Plus it is very inexpensive b/c I grow the plants in my yard. I do keep a growing plant near the kitchen.I guarantee that if you rub the gel on a burn IMMEDIATELY after burning yourself, the pain will stop and there will be little evidence of a burn afterwards. I thought that aloe vera is for hair only:) Nice post! I have benefited a lot from some of your tips . aloe vera is an excellent treatment for wounds, burns and other skin disorders. Cut the leaves in half along the length to reveal the clear gel inside. Rub the clear gel over skin. Aloe Vera is also use to cure skin irritating problems...Because it has vitamin E which is going to help to get rid of irritation. Aloe Vera is the most important herb in skin care. Its gel or fresh lump softens and nourishes dry skin and encourages skin regeneration after injury. It also helps prevent shaving rash; the crop of tiny pimples that appear after shaving. # Aloe vera has also been used to strengthen and improve the immune system because of the essential vitamins, minerals and enzymes it contains, as well as restoring vital amino acids your body needs.# Aloe vera has also been used to strengthen and improve the immune system because of the essential vitamins, minerals and enzymes it contains, as well as restoring vital amino acids your body needs. Some women have tried aloe on their eyelashes to achieve thicker and longer eyelashes. A very tiny amount of aloe vera gel applied to eyelashes at night before bed is suggested. Apply aloe gel to razor burns and let dry to help soothe and disappear. Applying aloe gel to healed wounds will help reduce scarring, or keep from scarring at all. If you’ve dandruff problems, you can apply aloe vera to your scalp (best if wet) and leave on for 15 minutes before washing your hair. Doing this regularly before each shampoo will help keep the dandruff to a very minimum. As a nutritional supplement, 30 ml for adults and 15 ml for children preferably on an empty stomach preferably in the morning is recommended to maintain normal health. As a therepeutic nutritional support, larger amounts may be used depending on the illness and as per body‘s requirement. Though Aloe Vera Juice taken directly is the most preferred, it could also be taken with water, juice etc. People may experience noticeable benefits within 6 weeks. However, we advise a regular intake for minimum 3 months for optimum benefits. A wonderful deep article. Aloe vera also contains Mannose an essential sugar that help optimize cell communication with other cells, it improves the healthy condition of both the skin and digestive system. Does anybody know if aloe vera can help reduce or even cure melasma? Aloe Vera Gel- Aloe vera helps improve hydration, soothes and heals skin. Chemical analysis has shown the presence of mucopolysacharides, a natural moisturizing factor. Aloe vera also has renown healing properties is anti-inflammatory and can soothe and help heal cuts, grazes, burns and insect bites. True aloe vera is watery and thin. When used as a sunscreen is it as effective as the commercial ones? if not how should aloe be applied to at least work very effectively against the sun. I like to just use natural aloe for protection.I have worries with the side effects of commercial sunscreens out there. I’ve resolved my digestion problem and got rid of all the unnecessary toxins and the fat my body was keeping from unhealthy reasons by just drinking the gel for 5 months (daily)! Aloe Vera juice also helps the persons who suffer from heartburn, ulcers and other digestive diseases. It also offers relaxation to the persons who suffer from indigestion and irritable bowel syndrome. In some cases, one can use it like a medication.It also decreases the pigmentation and dark spots of the face. Therefore, there are large numbers of uses of aloe Vera and it is supposed like a miracle substance. Many physicians suggest creams that contain aloe Vera which is beneficial for skin eruptions and allergies. Aloe Vera gels and lotions have become famous in the bazaar. Aloe Vera can be used like cosmetics and ayurvedic medications. Aloe Vera gels include 75 nutrients and proved to be the best remedy for burns and wounds. This plant is very beneficial to increase circulation of blood in the body. Aloe Vera has become famous for its moisturizing properties. It is useful to improve the ability of skin to hydrate. Actually, at present, Aloe Vera is an important ingredient in the all cosmetics product. Aloe Vera is very effective to reduce severe muscle pain, arthritis and joint pain. When aloe vera used directly to the affected area, it penetrates the affected skin for soothing the pain. Aloe gel has been used to heal skin lesions, skin irritation and dryness. Its success has also made it a common additive to cough syrups. Aloe works most effectively when applied directly from the plant. Therefore, it's a common first aid staple found in houses around the world. Skin care products containing natural aloe vera, are thought to be the most trustworthy defense against skin dryness and sunburn. Aloe Vera juice promotes lower intestinal function. Aloe Vera has anti inflammatory and wound healing properties and generally works as a mild laxative and can help in the treatment of stomach ulcers ............. IF you aren't sensitive or intolerant to it ......... my daughter breaks out in a rash if i use it topically on her and if i take it internally it bloats me and gives me nasty tummy aches ........ so yeah, in some people it will soothe burns, insect stings, sun burn, peeling, soften skin and hair ..... aid in digestion ...... and in others it will cause intolerant and allergic reactions like digestive issues, hives, rashes, itching, swelling etc...... and it can be extremely dangerous if taken internally by pregnant women.and, as another poster has already said, the best and most therapeutic source of aloe vera would be using the fresh leaves. Alow Butter- Specially formulated with natural Aloe to start healing, moisturizing, and soothing dry skin on contact. Rich emolllents penetrate deeply to restore skin's vital natural moisture, Never greasy formula absorbs quickly into the skin. What a lovely blog. It’s so well written, funny and honest. I really enjoyed it and will come back again. Aloe has two other qualities, which are well-known benefits. The calming and healing change it seems to have on damaged skin. Cuts, scrapes, burns, bug-bites are all eased immediately when gently rubbed with the thick gel. Some medical diseases like acne will also responds well to the aloe because of the inflammation of the skin's pores, which also produces swelling, irritation, pimples, and pustules, but the calming and healing benefits of the aloe helps the diseases. I've used it to treat a sunburn before - peel off the rough skin to get to the wet jelly underneath, and rub that on your skin. It helps quite a lot to moisturize and heal your skin! I really enjoyed this post. I will definitely check back later for more informative posts from you. Thanks! What are the benefits of drinking aloe vera juice? Thank you for this article. Helps a lot. Aloe Vera stimulates cell growth and tissue healing. It aids in detoxifying, cleanses liver, cleanses kidney, helps breakdown and eliminate trapped matter in colon and a gentle laxative. Powerful aid with digestion. Great for skin conditions such as boils, burns, hemorrhoids and anti-inflammatory. Wonderful antiperspirant. It has 20 of 22 amino acids including 8 essential nutrients. It is an excellent vitamin B12 source. Aloe vera capsules or juice sold as a digestive aid may benefit the digestive system, immune system and may help with inflammatory disorders. sooth skin injured by burns, irritations, cuts and insect bites. moisturize and soften the skin. speed the healing of skin wounds, burns and other injuries. when taken internally, Helps relieve constipation, diarrhea and other intestinal problems. May speed and improve general healing when taken internally. relieves itching and swelling of irritated skin. helps kill fungus and bacteria. Our bodies' really are the most amazing healers. But with stress, poor lifestyle choices, lack of adequate nutrition, too many processed foods, environmental pollutants, etc., we've gotten a bit run down. So we all need every bit of help we can get. Aloe vera is at the top of the list for helping us achieve not just good health… but great health. This was a great article on a few of the benefits and uses of aloe vera. There are even more! Take a leaf of an aloe-vera plant, break it into two and mix its juice mixed with rose water. Apply it on your face and neck for skin protection from tanning and clogging. This also helps to overcome the skin allergies, itching and rashes. aloe Vera was effective in treating a wide range of ailments, from kidney problems and constipation, to severe burns of the skin. Studies have shown that aloe vera speeds the healing process, particularly in burns, including those from radiation. It is also used by dermatologists to speed healing after facial dermabrasion, which removes scars from the skins top layers. As aloe vera makes your skin silk & smooth with firmed shape. u cut a aloe plant leafs and put that yucky stuff on the sunburn. Aloe has been well known for centuries for its healing properties, and both oral intake and topical dressings have been documented to facilitate healing of any kind of skin wound, burn, or scald - even speeding recovery time after surgery. Aloe-Vera-Benefits the skin. When used on the skin, Aloe Vera has the ability to penetrate the deepest body tissues, some seven layers deep, unlike most lotions, liquid substances and water that penetrates only two layers of the skin. It has been proven by research that the Aloe-Vera-Benefits comes from its active ingredients. Aloe Vera has over 75 known active ingredients that include: Vitamins, Mineral, Enzymes, Sugars, Anthraquinones, or Phenolic compounds, Sterols, Amino Acids that perform specific functions in the human body. The clear gel makes a protective coat over skin, speeds up the rate of healing and reduces the risk of infection. This is due to aloectin B, which stimulates the immune system. The mucilage in aloe, which contains mucopolysaccharides, is largely responsible for aloe’s healing action both on burns and wounds. I would like to inquire if aloe would be a good idea if applied to a scar remaining right after surgery. I have heard of the wonders of aloe vera and wanted to make sure it was fine if applied directly to the scar hours after surgery. I want to make sure my insicion heals nice to were it is very vague. AThe body can do amazing things if we give it the nutrients it was designed to function onloe contains a phytonutrient called mannose that every cell in the human body requires to function properly. With our processed, fast food, nutrient-depleted, chemical farming culture, we do not get enough (if any) of this and several other necessary phyto nutrients. Aloe will replenish this precious nutrient, allowing every cell in your body to function more efficiently. The juice from it can help a bug bite itch. I suffered with warts for years also when I was younger. I had them frozen off at the doctors and they still came back. If you have an aloe plant in the backyard, they break off some leaf and apply the clear gel to the wart as often as you remember, it may take a while to work, but they will slowly disappear. The gels you buy from the shops may also work, but the best is the plant itself. Aloe Vera is extremely helpful for your mouth and gums. It also assists in the soothing of minor burns, cuts, scrapes and skin irritations. in Healthy Digestion A healthy digestive tract ensures that nutrients from the foods we eat are absorbed into the blood stream. Aloe Vera Juice has natural, detoxifying abilities. Drinking Aloe Vera Juice made from the pure aloe gel regularly may improve bowel regularity and increase protein absorption, while at the same time reuse unfriendly bacteria and yeast – all done naturally! Immune Support and Function Aloe Vera provides natural support for the immune system Regulates Weight and Energy Levels Aloe Vera Gel naturally, and with regular use, allows the body to cleanse the digestive system. ensures a greater feeling of well-being, allowing energy levels to increase and helping to maintain a healthy body weight. Collagen and Elastic Repair Aloe Vera can add a rich supply of building materials to produce and maintain healthy skin. Daily Dose of Minerals Some of the minerals found in aloe vera include calcium, sodium, iron, potassium, chromium, magnesium, manganese, copper, and zinc. What a powerful storehouse! We all know that adding foods to our diets with naturally occurring vitamins and minerals is recommended for overall health. Daily Dose of Vitamins Aloe Vera Gel includes Vitamins A, B1, B2, B6, B12, C and E, Folic Acid and Niacin. Anti-inflammatory Properties Aloe Vera Gel has 12 natural substances that have been shown to inhibit inflammation without side effects. Aloe may also support proper joint and muscle mobility. Body-Building Blocks Amino acids are our body’s building blocks. Eight which are essential and cannot be made by the body are found within the aloe plant! Aloe Vera can be used to reduce our skin wrinkles and to take care of warts. For the treatment of sunburns and to use as a cream or ointment, a 20% or more content is needed. I use this Aloe vera gel/cream. Of course I applied it after applying first the Aloe vera facial water. It really helps your skin become smooth and fresh. (There are two of types of it, I think, or it depends on the country being sold; 1st it's a slightly wet & tends to have a velvety skin result. 2nd feeling fresh. not sure the exact meaning in English but I guess you got the point).But since mixing Aloe vera cream with a facial liquid foundation doesn't give a better result, I use an "ever mere" cream mixed with liquid foundation during the day or when I'm about to go out from home (work, shopping). "ever mere" cream is a product from France made from eggs. This is good also. But I would recommend you to use Aloe vera instead if you have no facial allergy or if your skin is not too delicate, as Aloe vera is a bit cheaper than ever mere. Give a try on a first day or two and you will know if it is better for you or not. If your skin is delicate, you will notice the allergy in just an hour or two after the application. Aloe Vera juice applied twice a day can greatly help in healing of the scars of the acne. Aloe Vera juice can be found at most health stores. strong laxative elements found in the outer leaf, they must pass the whole liquid through the charcoal filters, which inevitablyupsets the natural balance of nutrients found in the gel. FLP does not have to risk the integrity of the product by subjecting the gel to this filtering process. Since the traditional well-proven benefits of Aloevera are found in gel, not the rind, FLP discards the useless rinds , using them as natural fertilizers in its Aloe fields . Rubbing Aloe Vera gel on the hair and scalp every night helps in treating hair fall. skin brightener,good moisturizer and is effective in combating wrinkles because the skin absorbs it quickly – rub some on your neck and see for yourself,Soothe a sunburn,facial cleanser,Nourish your skin,Speed hair growth,Tighten your pores and Mix aloe vera into powdered hair dye before dyeing hair to help fight off moisture loss from drying chemicals. Aloe vera has been shown in clinical studies to have a positive effect on wound healing and holds anti-inflammatory properties. As stretch marks start out as microscopic tears in skin layers due to overstretching of the dermis, aloe vera helps heal these small wounds without causing scar tissue to form, effectively preventing the appearance of stretch marks. Aloe vera has been used for thousands of years by the Egyptians, Romans, Greeks, Arabs, Indians and Chinese to decrease the appearance of scars and to moisturize and heal skin. This extract from the aloe leaf protects skin from environmental factors and promotes skin regeneration. Aloe vera is a wonderful skin conditioner. While the scar is still fresh, apply a cream containing aloe vera or the juice itself directly to the scar, working it in gently to soften and loosen it. It works particularly well for facial scars like acne. Unfortunately, aloe vera doesn't work well on older scars, though it may soften them a little. I use it on my face it's soo great! Aloe Vera works wonders for skin..it can be used as a mosturizer with no stickiness, used to sooth minor irritations, can be applied on scalp also for dandruff...u can use it almost ANYWHERE for any purpose..I even use it mixing with the make up base. cant live without it! Apply fresh aloe juice on the affected area with pimples. Fresh aloe juice can soften the skin and stop the pain and inflammation thus caused. In the severe cases of pimples, take aloe juice orally twice a day, 10ml. each time can help a lot on pimples. This home remedies for pimples has been applied and validated for millions of people. I am allergic to aloe vera. 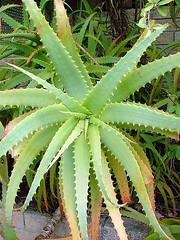 Aloe vera has traditionally been used for the curing of burns & wounds. The dried leaves being made into a resin and given to relieve constipation. From rashes to sunburns, cuts to kitchen burns, the "heal-all" juice can be used directly from a piece of leaf, or made into a salve. This use is due to the Aloe's ability to regenerate damaged skin tissues, which it does very quickly. Aloe gel, reduce swelling and itching, and antibacterial and ant fungal. They also increase blood circulation and activate skin cells to heal. -helps to make you regular and eliminate constipation. 4) Aloe is a Natural Anti- inflamitory - Acne anyone? Redness? Aloe cleanses, removes impurities,and shrinks and tightens pores all at once. relieves itching and swelling of irritated skin. helps kill fungus and bacteria. I know it helps burn relief. ex: you got a burn/sunburn, pluck a piece of aloe Vera plant to where the juices are visible and rub it on the burn like you would a lotion. Promotes hair growth /arrests hair loss: Mix Aloe Vera gel with, castor oil, olive oil and apply. Skin nourisher: Massage a blend of castor and mustard oil with aloe Vera gel into your skin and wait for the magic! Pregnant and breast feeding women should not use aloe latex (the laxative part) internally, although the topical application of aloe to the skin has no effect on pregnant or breastfeeding women. skin irritation, burns, scalds, sunburn, wounds, eczema, psoriasis, acne, dermatitis, to stimulate cell regeneration. IT cure against gastronomical disorders, headaches, kidney problems, chest inflammation, sinus and more. Aloe Vera gel is gentle on the skin and is known to soothe irritated skin. If your eyes sting, burn and water after a long day in front of the computer,Try washing your eyes with aloe Vera gel. aloe vera gel can also be applied in and around the eyes to get rid of hideous dark circles as well. Very informative post. Thank You for taking the time to share it with us. Overdose or prolonged use of Aloe Vera can lead to deficiency of certain minerals from your body, such as potassium. Your bones can also get weak because of an overdose of Aloe Vera. It has plenty of vitamins and minerals in it. It’s rich in nutrients and that makes it good for curing so many ailments. Aloe Vera also includes enzymes, amino acids, and traces of natural sugars that are required for our body. Aloe products for internal use have been promoted for constipation, coughs, wounds, ulcers, diabetes, cancer, headaches, arthritis, immune-system deficiencies, and many other conditions. Aloe Vera is also very effective in eliminating the severe muscle and joint pain that can grow with arthritis. How much aloe vera should I drink in the morning and at night? Aloe is also used in folk medicine to treat fungal infections of the skin, such as athlete's foot. Fungal infections are treated by crushing the leaf pulp and placing the resulting paste over the affected area, as a poultice. Aloe is considered helpful against heartburn because it acts as a natural buffer of the gastric juices. In this regard, it is recommended to take it regularly on an empty stomach. By drinking Aloe Vera it can heal internally, just make to prepare properly if you use it internally. Many health food and beauty shops recommend drinking it as well to look after the digestive tract and stomach. Avoid aloe preparations if you are pregnant, breast feeding or menstruating, as it can cause uterine contractions. Does aloe juice help to avoid pregnancy of 3 weeks? Hw much quantity to be taken to avoid it? @Anonymous comment #129: No, you have to consult a gyneaecologist for that! I'm 16 and can I use aloe Vera gelon blackheads prone skin?im now using coconut oil from body shop and I don't like to use it during the day cause it tends to get oily on my face.i wanted to use the aloe Vera gel as a daytime moisturiser that we can get it on farmacies like watsons and guardian. If there was any magic Plant, Alovera should be rated first! It works wonders on every aspect of health, only that you have to know how to use it properly. Thanks for the recommendations. blend some aloe vera gel with mango pulp and lime juice. Apply it on the face for 20 minutes. Rinse it off with cold water. This will refresh your skin and make it glow.